What would you do with super-fast powers? Well, if you're Barry Allen, aka the Flash, you might use your powers to solve crimes and stop other meta-humans from causing trouble. Get a feel for what it's like to be the swift superhero by donning this Deluxe The Flash Costume, from the hit show on The CW! Being a speedy crime fighter would have its perks, but you couldn't spend all of your time thwarting villainous plots. Luckily, the coolest part about being as fast as a lightning bolt is that you can quickly get all the important stuff on your to-do list out of the way, so you have more time for the fun things! Grocery shopping would be a breeze if you're running at full speed, but you'd want to be careful since all the friction you cause from breaking the sound barrier might melt your frozen goodies. And think of all the money you'd save on gas thanks to not driving everywhere, although you'd probably want to set a bit of that cash aside to replace all the running shoes you'd be burning through. Actually, being the Flash sounds harder than we thought, so maybe just looking like him is the best way to go. 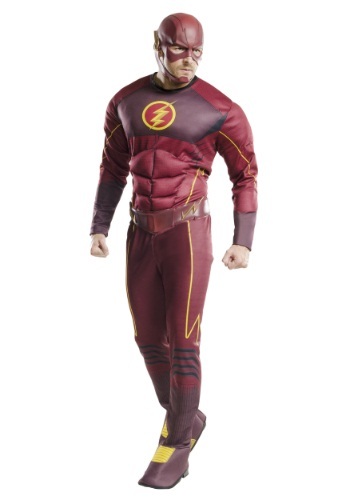 Since this is a deluxe costume, the jumpsuit features all of the details you need to recreate the high speed hero's look in the TV series, including built-in elastic boot tops and stuffed muscles stitched into the front. And while this costume won't give you super-speedy powers, it will make everyone think you're about to zip away in the blink of an eye, without all of the extra hassle that comes along with it!